A cyclists powers though a section of the new Breckenridge pump track in the Wellington neighborhood. The town is hosting an opening celebration for the track today at 4 p.m. When: Monday, June 15 at 4 p.m.
A new summer distraction is coming to the Wellington neighborhood in Breckenridge. 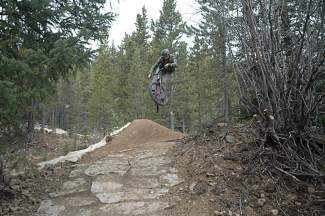 Locals and anyone with a love for biking’s wild side are invited to the grand opening of the Wellington Bike Park and Pump Track today at 4 p.m.
Mayor John Warner and the Town of Breckenridge Open Space and Trails Division are hosting the event for adrenaline junkies to learn about and enjoy the town’s latest bicycle facility. The park is designed as a fun recreational playground where riders of all ages can improve their bicycling skills. The facility was constructed by Peter Mills of Elevated Trail Designs and members of the town open space department’s trail crew over a six-week period. It is designed for all abilities and features a large pump track, a Stryder track, three flow trails (one beginner and two intermediate) and a skills area featuring “skinnies” with a small rock garden. Mayor John Warner echoed the excitement towards the project. The Wellington Bike Park and Pump Track is located at 710 Wellington Road (behind the Breckenridge Equestrian Center). The park is free to the public. Riders should have a clear understanding of their ability level and wear protective gear, including a helmet.